Cherabun station used to be by the river, i was born there like everyone else, 500 blackfellas working for the station man there. Me and my sisters and brothers, one gone, I grew up hearing Walmajarri, only Walmajarri people there. Old people there telling story about waterhole to waterhole, blackfella living on their own country, later I heard lots of languages spoken in other places, east, west, other mobs. The borders where different then, now whiteman came and put fences through the country. Blackfella would just know his territory by that water hole you know, thats my territory. Back then people where making boomerang and coolamon, painting them, but not for money, for themselves, they didn’t know money. Spears, shields, they were their fighting weapons. Nowadays i see people using kung fu, and 'left and right' (boxing) but old people didn’t know that. My father learnt how to fight from a station man, to defend himself, so thats my family name. Pampila, pronounced Bombala, also uses the name Hanson Boxer. Pampila was born on the banks of the Old Fitzroy River at Old Cherabin Station. Pampila’s artefacts are highly sought a er. His repertoire includes figures of Walmajarri men in traditional dance head-dress from the Majarrka Corroboree, boomerangs (karli) and clapping sticks. The karli may be watarka (hunting), wilgin (‘number 7’, hunting/fighting) or yilbidi/jarangarr (singing), and are generally carved from Bloodwood. Goanna or kangaroo fat is usually used to oil the boomerangs, though bullock fat may also be used. Pampila is the son of the famous Fitzroy artist Boxer Yanker who married Paji Honeychild Child; Pampila calls her Mummy One. Pampila Hanson Boxer was born on Old Cherabun station in 1941. His father had walked in from Kaningara, in the Great Sandy Desert as a child in the 1920's. Pampila grew up on the station where he learnt to be stockman from the age of 12. 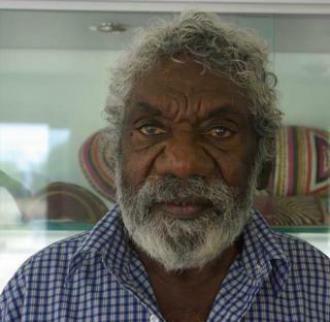 He worked on Old Cherabun and other West Kimberley stations for 20 years, until the implementation of award wages for aboriginal stockmen caused most of them to lose their jobs. In 1989, after almost 10 years of letter writing and talks with state and federal politicians and government departments, Pampila was successful in acquiring a 99 year lease on an excision from Old Cherabun Station. During the next 15 years he and the other families who had grown up on the station established Yakanarra Community, which today (2006) has 150 residents, 30 houses and operates its own store, independent community school, Telecentre and adult education centre. He is an important law and culture man for his community. 2008 25th Telstra Na onal Aboriginal and Torres Strait Islander Art Award, MAGNT, Darwin.